Faux wood blinds are classified either as a Composite, which is a blend of PVC and wood pulp or as PVC, which is an extruded PVC plastic. 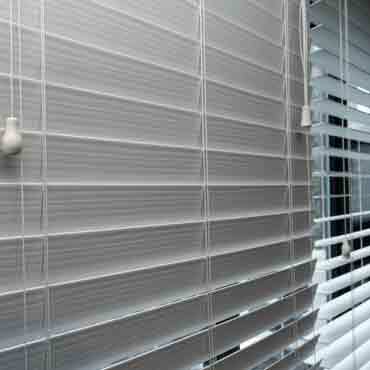 They can be opened or closed by tilting the slats for light control and privacy. These blinds have the look and feel of wood but are heavier in weight, available in limited colors, require a greater number of ladders to support their less rigid slats, but are lower in price. These blinds are available in 2-inch and 2 ½-inch slat sizes, in a limited range of colors and wood tones, along with a wide selection of decorative woven cloth tapes, valance and cornice options. They are very durable and easy to maintain. Faux woods will not to crack or warp, and are recommended for high humidity climates and rooms that may be subject to moisture, such as bathrooms, kitchens, and laundry rooms.